All in a small area. In this shot there are buildings from a few eras. The castle was originally a Motte & Bailey. Built by William the Conquerer, in the late 11th century. 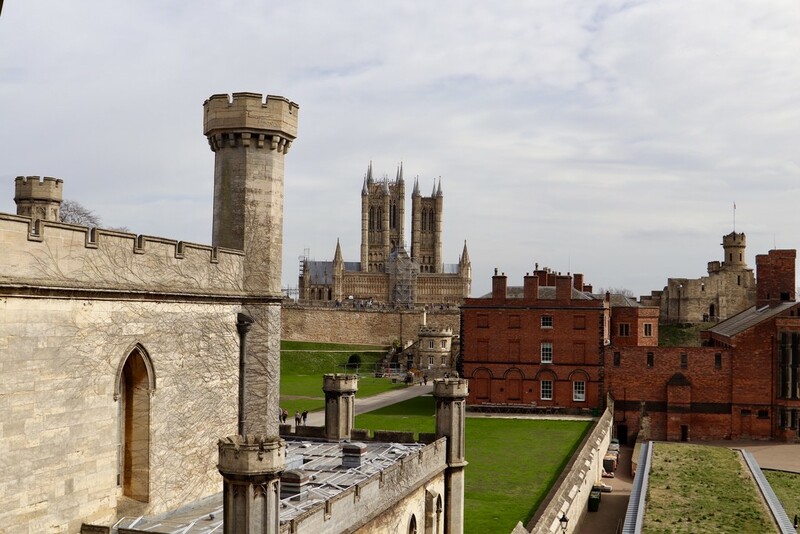 The building in the left fore ground is Lincoln Crown Court & is in use today. The Cathedral, outside of the castle walls, but can be seen for miles around, started to be built in 1072 & took nearly a hundred years to construct, still very much in use today. The red brick buildings are two jails built by the Georgians & Victorians. Now a museum. Public hangings of murderers used to happen at the castle until 1868 . Bodies are buried on the original Motte ( Lucy Tower). The tower with the flag was constructed by the victorians on the second Motte & at one time housed an observatory. Took the granddaughters to have a look around today. And you had a beautiful spring day to explore all of the history of this place ! Great capture and history lesson. Great shot, lots of interest. Yes, magnificent buildings. Well composed shot here. These old castles are just amazing to me. Nicely captured. Good shot. Interesting narrative. Fav! An amazing scene, so much history!